Over the years, people have tried to decipher Pedro Ximenéz (also known as Pedro Jiménez or Pedro), the emblematic grape from the south of Spain for its viscous wines with rich density rarely seen in other corners of the world. Internationally renowned for its use in making Sherry, Pedro Ximenez’s origins have been hotly debated. Personally, I am a huge fan of Beau’s description of this grape at Basic Juice, “if you ask me where it came from and who brought it here, I’ll most likely suggest a weekend with Google and I’ll be sure to request a report back from you.” He’s right you may be at it for awhile. Pedro Ximenéz only makes sweet wines! While it’s true that Pedro Ximenéz does make some of Spain’s greatest sweet wines, that’s not all it makes! In the Appellation of Montilla-Moriles, wines of varying levels of sweetness are made from this noble grape. The whole range of sherryesque wines made from Pedro Ximenéz include: dry olorosos, dry amotillados and fino style wines, which are all crisp, soft and full of delicate nuance. In fact, going back to our friend Beau at Basic Juice, you can find a nice link on this Spanish wine, made from Pedro Ximenéz. Personally, one of my favorite wines made in a dry style from Pedro Ximenéz is the Bodegas Alvear Fino en Rama from Montilla-Moriles. To dispel a small side myth, this solera aged wine is a vintage wine, proving that you can have, in rare instances, a vintage aged solera wine. Pedro Ximenéz comes from Germany brought to Spain by a man named Peter Hirtzman. Evidently, this is false and in truth, no one is quite sure where this grape comes from. Search high and low and ask a thousand different “experts” and all you’ll come up with is a handful of “maybes”! While I encourage researching the history of a grape and its origin, it’s not always possible. Someday we may have a clue to its source but currently, all we have is legends and theories. Maybe someone out there has some time to kill and wants to do a search for this grape’s mysterious origin, but for now, we’ll have to dispel the myth by removing the false truths, leaving us with another mystery for another day. Pedro Ximenéz can only be found in the south of Spain. Wrong again! This grape is toyed with all along the coast of southern Spain, in LaMancha, and in rare instances, in Galicia. Though it does do best in warmer climates like those of Australia where people have been making Botrytis affected wines from Pedro Ximenéz for many years. So there you have it! We have debunked a few myths about this infamous grape and filed them away in our Myth Buster Archive. 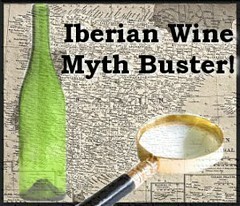 Remember, if you have a myth or question about wines from Iberia, please let us know and we’ll do our best to get you an answer right away!